You Tweet, We Tweet, We All Tweet! Ok, you know me, I am pretty honest with you all. If I love a bag, I tell you. If I hate a bag, I tell you. And all of that is true no matter if you agree with me or not. So here is where you can continue to express your opinion… TWEET WITH US! Many of you follow us on our Purse Blog twitter page, but there is another one you should know about and follow. Our Bag That Style twitter page. And trust me, follow us… it will be worth your while! If you like celeb gossip and style (whether you admit it or not), this is the site for you! Winner of the Glam Network Awards! Thanks to all of you, we have won the Glam Network Award for Best in Shopping for 2009!! With all of your votes and help, we have won three years in a row now. We have loved the journey Purse Blog has taken; from having only friends and family reading, to having hundreds reading, to having thousands reading. We will continue to bring you fresh content, from designer interviews to giveaways to images, and continue to modify what we do to keep things fresh for our readers. A very special thank you from the growing Purse Blog team to all of you!! Also, check out all of the other fabulous Glam Network Award winners at Glam.com. How could this week be any better? Vlad flies back from Germany today, tomorrow is Thanksgiving with the family and no work, and today we had a feature in The Miami Herald. We were interviewed for this piece by Kathryn Wexler who met us at our house and had the opportunity to learn more about Purse Blog. Kathryn saw us in our true element, though I did wear a nicer blouse than I typically walk around the house/office in and I had a tinge of make up on. I constantly attest to the fact that we are laid back, and Kathryn will agree with this! The article, A Virtual Purse Party, lets you in on the ins and out of our website and our business. The boxes of bags that come in for us to review and shoot in our photo studio continue to grow, leaving our front entry wall practically impassable. 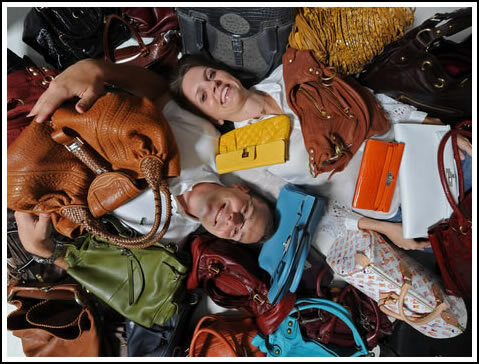 From $300 to $35,000 bags, our office is constantly seeing the latest and greatest from the designer handbag world. But we are a close knit trio, me and Vlad and my sister. We know the latest and greatest from the fashion world and the runways, but choose to wear jeans and tee shirt and rock out an amazing bag. Kathryn Wexler depicts our story, how our site started, and where our site is going perfectly. Welcome all the new South Florida readers!! And a special thank you to The Miami Herald and Kathryn for the piece. First off I have to say thank you for being so patient with our sporadic, random, and lack of postings this week. I caught a nasty flu-like, incessant headache, cold/flu/virus and have not quite been myself. Luckily we have had our new writer, Amanda, there to pick up some slack.